There's more to getting on and off the bus safely than putting one foot in front of the other. From GPS speed and idling reports, to engine diagnostics, preventive maintenance and regular driver training, everything we do at Student Transportation Inc. is designed with the safety of our passengers as our top priority. Always walk ten feet in front of the bus - never behind the bus. Always stay at least five giant steps (ten feet) away from the side of the vehicle while waiting at the bus stop or immediately after exiting the bus. If you drop something, tell the bus driver – never stop or bend over to pick it up. Stay on the side of the road, away from traffic, until the bus stops and the driver signals to cross. When the driver signals that it is safe to cross, you should first check for traffic. 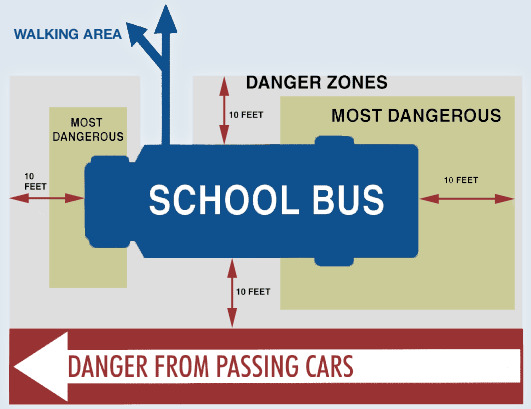 Many motorists illegally pass stopped school buses. So you (and the bus driver) must check for traffic in both directions: look left-right-left. As you cross in front of the school bus, watch the driver. If you can see the driver, the driver can see you. Board the bus using the handrail. Move toward the rear of the vehicle quickly without crowding or pushing. Stay seated until the bus comes to a complete stop. Do not push or play as you exit the bus. Use the handrails to avoid falling. Make sure that all backpack straps, drawstrings and clothing do not get caught in the handrail or the vehicle door. Look toward the rear of the bus before stepping off the bus. By looking to the rear of the bus, you can make sure that no motorists are passing on the right. Move ten feet away from the bus at once. Stay on the side of the road away from traffic and ten feet ahead of the bus where you can see the driver’s face. When the driver signals that it is safe to cross, cross to the outside edge of the bus and check both ways for traffic. If it’s clear, cross quickly. If it’s not clear, return to the curb. Once off the bus, go straight home. SafeStop is a school bus tracking app that provides parents with valuable information about the location of their child’s school bus, including Expected Arrival Times and student scanning. Using GPS tracking, SafeStop combines security, safety, and communication into one easy-to-use school bus tracking app. Learn more about SafeStop!